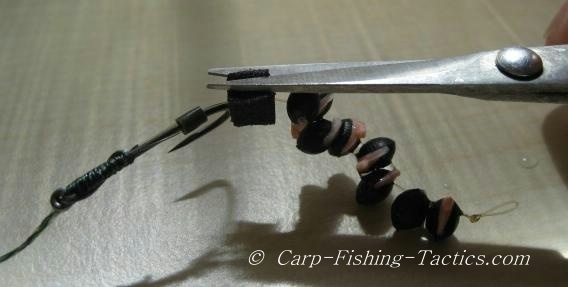 Here is my favourite carp rig. I think this is the best rig I have used so far. Carp love hemp and many anglers use it to create a bed of bait, but most carp anglers don't fish with it on the hook. This means a lot of carp have learned to associate hemp as safe to feed on. If this critically balanced hemp rig is set properly it can be very effective when placed on top of a bed of hemp. 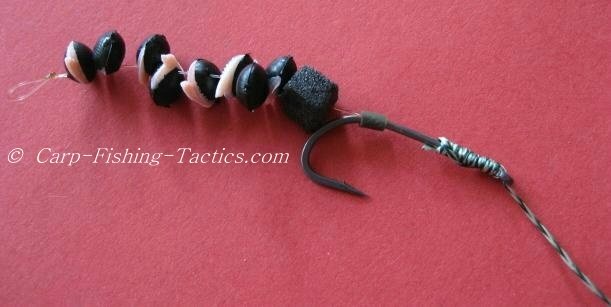 For this carp rig I used a Korda long shank hook size 6, the hook link is Merlin 15lbs. 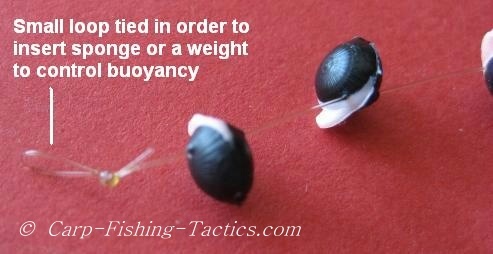 The length of the hook link material will depend on the fishing situation you encounter. The hair is made of 5lb mono line. Care should be taken when threading the fake hemp onto mono line. The enterprise brand of fake hemp is hard rubber and it is very difficult to get the needle through. I did find that the white area seems to be slightly softer. SAFETY!!! If you cannot protect your thumb and fingers when threading on the fake hemp, then I recommend you find a way to glue the hemp to a hair! Thread hair through hook rubber then through its eye. I also thread it back through the rubber, this keeps the hair long and enables me to break this rig down (if hook becomes blunt) and create another hemp rig without having to thread on new fake hemp pieces. I trim the sponge and test the carp hemp rig for buoyancy. 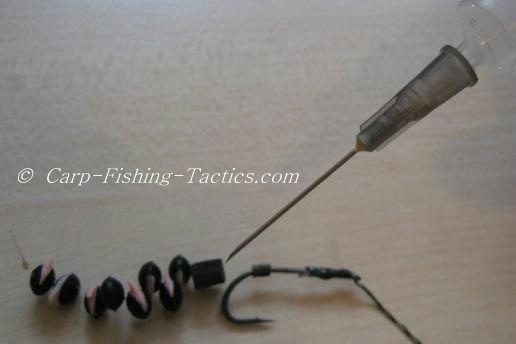 You can add sponge or a shot to the front of this carp rig to control exactly how it behaves in the water. See details on changing the hemp rigs buoyancy! Adjust the buoyancy until the hemp pieces sink very slowly to the bottom. You can add weight or sponge to the loop at the front to control how the hemp rig pivots in the water. An overview of how the finished hemp rig looks in water. 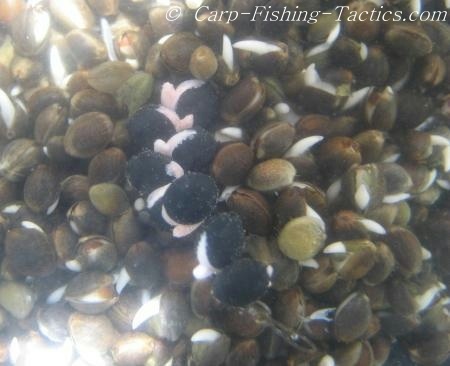 To help hide the size of the hook used I always surround this carp rig with lots of free hemp and particles. In fact, it's much better to cast it out in a PVA bag or dynamite stick full of hemp particles. Yes, it is possible to put hemp in a PVA bag without it melting! When ready don't forget to add liquid attract the carp. I prefer to soak them for a few days, this is the reason I prepare most of my carp rigs at home. 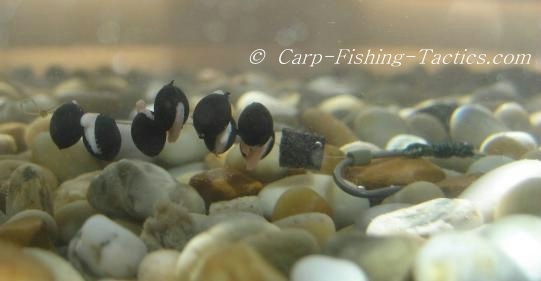 Click here for details on changing the hemp rigs buoyancy!